SAN FRANCISCO -- Google's upgrades to its Pixel smartphones and other gadgets are its latest steps toward turning its digital services into your backup brain. The products the company unveiled on Wednesday are packed with artificial intelligence that Google has accumulated from those very same services. The company's widely used search engine, Gmail, maps, Chrome web browser and other services have yielded a fountain of data the company has used to smarten up its software and gadgets. Over the past year, Google has been transplanting that knowledge into its Pixel line of phones, internet-connected speakers and, as of Wednesday, a new type of laptop and a small, hands-free camera that automatically learns when to snap pictures or record video of candid moments. "All that hardware is just housing, and that isn't as interesting as what's inside the house," said Gartner analyst Tuong Nguyen. "The hardware is just a way for Google to show people the best way to experience its services." Google recently signaled a long-term commitment to its own phones by spending $1.1 billion to bring on board 2,000 HTC engineers specializing in mobile devices - and to acquire some related technology, too. Although sleekly designed, Google's Pixel phones and Home speakers aren't breakthroughs in themselves. In many respects, Google is simply copying or offering slight variations on devices made by Apple and Amazon that have been bigger hits so far. But Google believes its services, particularly those driven by AI, can give it an edge over its rivals. If its devices catch on, they'll then generate additional data that Google can use to further refine its AI systems. Already part of Google's smartphones and speakers, the assistant will soon also be featured in the new Pixelbook laptop and in new wireless headphones called Pixel Buds. It will be easier to summon in the next generation of Pixel phones; a new feature lets you squeeze the side of the device to ask a question. Google's emphasis on its assistant is part of a battle with Apple's Siri and Amazon's Alexa to prove which is the most intelligent and efficient aide - one that might, one day, become a trusted companion. 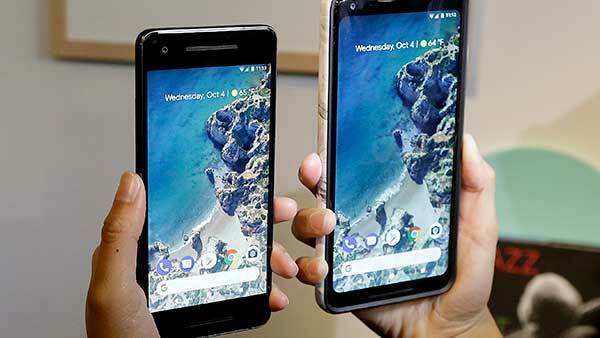 The second generation of Google's Pixel phones unveiled Wednesday feature larger, brighter screens that take up more of the device's front, changes that Apple is also making with its iPhone X scheduled to be released next month. Both the 6-inch Pixel XL and the 5-inch Pixel will also do away with the headphone jack, something Apple did with the iPhone 7 last year. Google also souped up the already highly rated camera on the Pixel, boasting that it will take even better photos than the iPhone. The Pixel 2 and Pixel XL 2 are adding a new mode for taking portraits, another popular feature on the iPhone 7 and recently released iPhone 8. But instead of relying on two cameras to take better portraits, Google is using AI software that adjusts photos automatically to enhance close-ups and blur backgrounds. The smaller Pixel will sell for almost $650, $50 less than the iPhone 8. The Pixel XL will sell for almost $850, or $50 more than the iPhone 8 Plus. Prices for the iPhone X, by comparison, start at $1,000. Google also announced wireless headphones, called Pixel Buds. In addition to relaying audio from the phone, the headphones can also translate spoken language in real time, working with translation software built into the new Pixels. The feature also will be coming to last year's Pixel models in an update. Another new photo feature, called Lens, will automatically display information about a landmark or piece of art in a picture. This will also be added to last year's Pixel models as Google tries to build brand loyalty. The company, a subsidiary of Alphabet Inc., still has a long way to go before making a significant dent in the market. In the past year, Google sold just 2.8 million Pixel phones, accounting for less than 1 percent of the worldwide market, according to the research firm International Data Corp. Most of the Pixel buyers so far have been "fanboys and fangirls who understand and appreciate what Google brings to the table with Android, and voraciously take advantage of every new feature," said IDC analyst Ramon Llamas. The Google Home Mini unveiled Wednesday is a button-sized speaker covered in fabric. It includes the same features featured in a cylindrical speaker that Google rolled out last year in response to Amazon's Echo . The Mini will cost almost $50, roughly the small price as Amazon's smaller speaker, the Echo Dot. The standard Google Home speaker costs almost $130. Last week, Amazon announced the next generation of its Echo speaker, coming out in time for the holiday shopping season, will cost just $100, a price that Google decided not to match. The Google Home Max is a rectangular speaker with superior acoustics for playing music, mimicking Apple's HomePod. Google is selling the Home Max for almost $400, about $50 more than the HomePod. Both speakers are due to hit stores in December. In a surprise move, Google is introducing a hands-free camera that will automatically take photos and video for people looking to catch candid moments of their family, friends and pet. The small, square device, called Google Clips, can capture images of everything within its range of view. It will rely on AI to decide what and who is important to its users so it knows the best times to snap a photo or record video. Google is promising that privacy controls built into Clips will give the camera's users complete control over the images they want to transfer to another device or to share with someone else. Clips will sell for almost $250 and will be available in stores in December.